If dishes could be classified as masculine or feminine, Cured Pork or Fermented Pork is a manly dish because it’s a favorite snack with the men when they’re hanging out and drinking beers. The tartness of the appetizer in contrast to the cold, often bitter beer, spicy garlic and chilies is an addicting combination. If you’re making this as a treat for the boys, make a double batch. Gals, this dish isn’t just for the boys, so make sure you save some for yourself before they eat it all up. 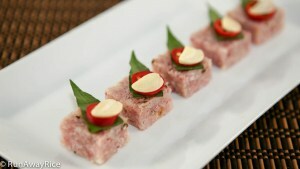 This dish is traditionally made with raw pork which is fermented with a combination of salts and nitrates. If you’re squeamish about eating raw meat, albeit fermented, you’ll love this recipe twist which uses cooked ham. I use leftover Easter ham which is typically a glazed, spiral cut ham. If you don’t have any leftover ham, deli ham works well too. The cooked and sliced pork skin that I use was previously frozen. The instructions on the package tell you to rinse it with cold water but I prefer to blanch it to remove the odor common with this product. Combine water, vinegar and sugar in a large bowl and stir until the sugar is dissolved. Cut the ham into smaller pieces. Put the sliced ham into the marinade making sure it’s immersed in the liquid. Cover the bowl and refrigerate for at least 8 hours. Transfer to a colander and allow to drain for 15 minutes. Smash the black peppercorns and set aside for now. Bring a large pot to a rapid boil and add the salt. Add the pork skin and swirl in the boiling water for 15 seconds. Drain and rinse with cool water a few times. Stir and toss the pork skin in the colander to remove the excess water. Use a salad spinner if you have one. Transfer the pork skin into a food processor and pulse 6 times. Transfer into a large wok and spread out evenly to avoid clumping. Put half of the ham into the food processor along with 2 garlic cloves. Pulse for 45 seconds to 1 minute. Transfer into the wok. Repeat the steps with the remaining ham and garlic. Over Low heat, combine the ham with the pork skin mixing it thoroughly. Add 2 Tbsp water. Cook for 3-4 minutes stirring constantly. Add the smashed peppercorns, toss together and then remove from the heat. Scoop out 1 cup of the mixture and spread evenly into an 8×8-inch dish. Repeat the steps adding a total of 4 cups of the mixture into the dish. Use your hands to press the mixture firmly into the pan filling in any gaps. Use a spatula to firmly press the mixture into the pan making it smooth and even across the top. Cover with plastic wrap and chill in the refrigerator for 4 hours. Put 3/4 cup of the mixture onto a piece of plastic wrap. Shape it into a log. Wrap the plastic wrap firmly around the log. Twist the ends to compress the log. Remove the plastic wrap and discard. Place coriander leaves, sliced chilies and garlic on the log and then tightly wrap in plastic wrap. Repeat until all the mixture is used and 4 logs are made. Refrigerate the logs for 4 hours. 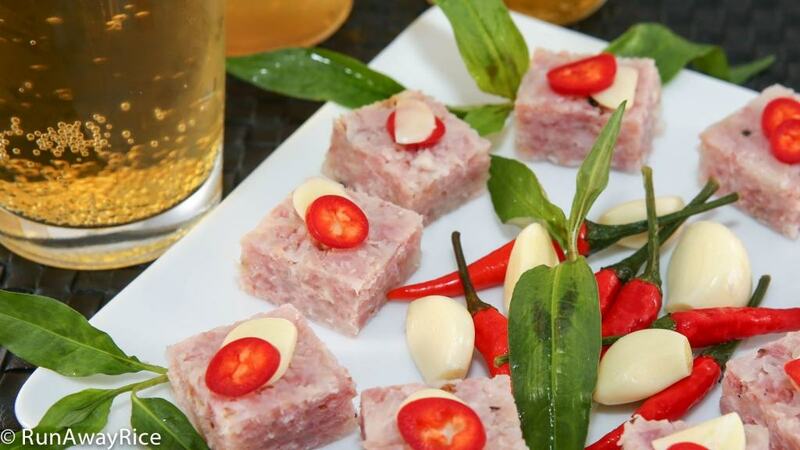 To serve the cured pork as an appetizer, cut into small pieces and garnish with more coriander leaves, sliced garlic and chilies. Optionally add the cured pork as a side for noodle bowls and other savory plates. Refrigerate any uneaten portions. The cured pork can be stored in the refrigerator for up to 2 weeks. Why did mine turn out mush and not firm? It’s really hard to say. Did you make any changes to the recipe? Hi there, I was wondering, when do you add the salt? Add the salt when boiling the pork skin. Good Luck with the recipe! I’d like to make beef nem chua for my office but a few of my co-workers can not have pork. Is there a way to make this dish either the original way or shortcut way without the pork skin? The pork skin provides the gelatin to bind everything together. You can use gelatin in the powdered form instead of the pork skin but, keep in mind, gelatin is an animal byproduct. If you’re familiar with using agar agar, this is a good vegetarian substitute for gelatin. Let me know if you have any questions. If I would like to replace all pork skin by gelatin, how much is it for this recipe?! Use 2 tsp unflavored gelatin. Mix it with the water and then combine with the ham. Good Luck! Hi Trang, we followed your recipes but the nem is not chua at all. What did I do wrong? 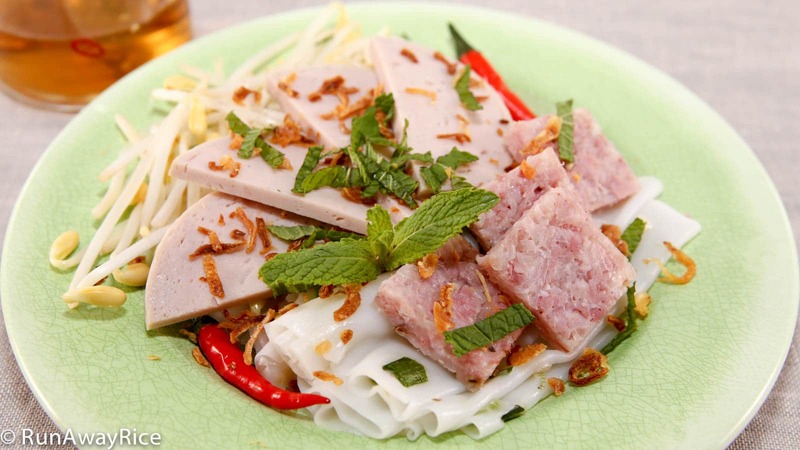 We love your recipes…..by the way do you know how to make banh lot?